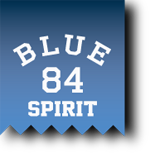 Blue 84 will increase your team and school spirit by outfitting everyone in the hottest styles and designs. We offer a hassle free, 100% guaranteed, cash back spirit wear program that is simple, easy, and effective. Have any questions about ordering or programs? Click the link below for our FAQ. Want an online spirit wear store? Blue 84 provides custom online stores for your school or program. Give your students, faculty and team members the opportunity to order spirit wear online. We are the largest and fastest producer of quality apparel out there. We produce over 5 million units annually and our pricing ROCKS.